The Indianapolis Airport Authority board has approved five new contracts for specialty retail and services vendors at Indianapolis International Airport (IND) as part of its Concessions Refresh initiative which was launched in 2016 to address the pending expiration of 43 existing retailer, services, and food and beverage (F&B) locations. The new retailers will provide a mix of national and local brands, many of which will feature locally sourced products in their stores, reflecting the culture and community of Indianapolis and the state, all focused on elevating customer experiences at IND. The five retail groups were chosen from a field of 16 entities that responded to the airport’s solicitation and represent some of the top trending national, regional and local brands. The announcement affects 23 retail and services locations in the terminal, some with expanded storefronts that exist today, and others with new construction. The new retail contracts represent a 45% increase in local sourcing of products grown or produced in Indiana, a 40% increase in retail concepts that represent the Indianapolis culture, and a 92% increase in diverse business participation. Five of the retail locations are anticipated to open around the fourth quarter of 2019 and construction projects will begin in or before the second quarter of 2019. The Concessions Refresh initiative will include a phased three-year construction plan ensuring airport passengers and guests have access to the products and services they need while traveling. 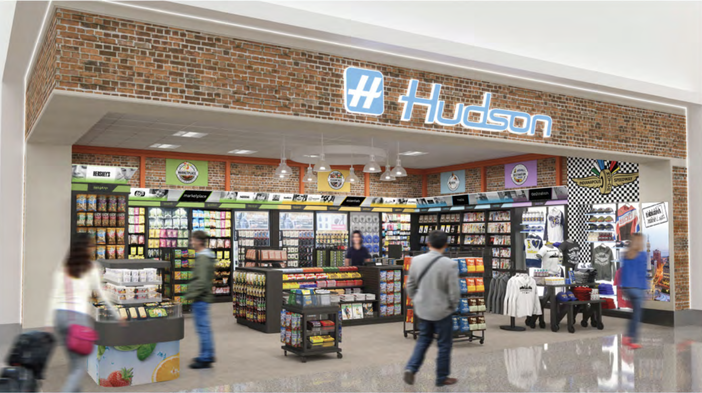 Hudson Group will open a total of four news and convenience shops in Civic Plaza, Concourse A and Concourse B, with two headlining Indiana-themed names and designs, and all featuring locally crafted goods and products. There will also be a retail bookstore in Concourse A featuring a wide selection of books, newspapers, magazines, and gifts. Additionally, Hudson is bringing nationally recognized stores, such as Tumi featuring high-end luggage, handbags and travel accessories, and Vineyard Vines with casual and professional men’s and women’s clothing. Tumi will be located in Concourse B in a newly constructed space, and Vineyard Vines will be located in Concourse A.
Hudson also will open Tech on the Go in a newly constructed space in Concourse B with a virtual reality/gaming station and a FAO Schwarz shop in Civic Plaza to offer passengers the ability to shop for toys in an ‘experiential’ and iconic space. Paradies Lagardère will open three news and convenience shops that will offer locally crafted goods and will also offer passengers the opportunity to buy athletic gear, electronics, jewelry and beauty supplies with additional shops. No Boundaries, located in Concourse A, will offer men’s and women’s sports clothing from nationally recognized brands. Esavvy/The Scoreboard in Concourse A will offer gaming and electronic products, as well as sporting attire from professional teams. MAC, a top cosmetic brand with a variety of beauty products will open in Concourse B. Brighton offers passengers men’s and women’s accessories and is known for exquisitely crafted handbags and jewelry among an extensive product offering. Brighton will also be located in Concourse B in a newly constructed space. Another local and long-standing airport service provider, Enroute Spa, will enhance its two locations in Concourse A and Concourse B. The Concourse A location will include a comfortable lounge area for customers to charge their devices and store their luggage while waiting for services to begin. The Concourse B location will expand to offer a full spa menu. Natalie’s Candy Jar will move from its current location to open new stores in both Concourse A and B, offering more than 400 varieties of candy. The next round of Concessions Refresh contract approvals is anticipated at a subsequent board meeting in early 2019, in which new F&B vendors and additional retailers will be announced. New airport offerings will reflect a sense of place that tells the story of the Indianapolis/Indiana community – either by representing a local brand and iconic landmark or selling locally sourced products, ultimately driving economic impact within the community.